The Byker Bridge over the Ouseburn between Newcastle and Byker. 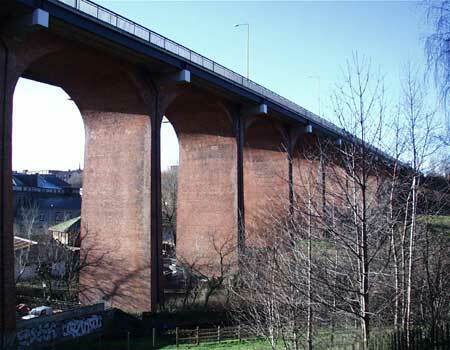 Opened: 19th October 1878 by the Vice-Chairman of the Byker Bridge Company. Traffic: Road. (Half-Penny Toll, withdrawn 1895). Length: 1130 ft (344.65m). Width: Originally 30 ft (9.15m) widened to 50ft (15.25m) in 1899. The Byker Bridge was opened by the Vice-Chairman of the Byker Bridge Company to pedestrians on 19th October 1878 and to carts and carriages on 27th January 1879. There was a half penny toll, but this was withdrawn on 12th April 1895. Origianlly only 30 ft wide but was widened to 50 ft in 1899. The deck of the bridge was rebuilt May 1985-March 1986.